Jason Halstead has created an engaging tale in Wanted, a story which brings four people together under extraordinary circumstances. Carl is a hermit who retired from the military and set up a hideout in a desert. Jessie is a woman who had no choice but to leave the military after a suicide bomber killed her team and scarred her for life. Years later, the two meet and, after spending a short while together, Carl sends her packing. Not long afterwards, Jessie returns with Tanya and Dustin, two teens who survive the plane crash which killed their mother and several others. 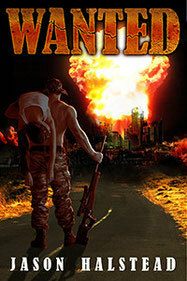 However, action soon begins in Wanted. The relatively peaceful life Carl has led soon turns to chaos as people begin hunting the teens. The story had me going through the desert, seeing the Rocky Mountains and hiding out. I could even imagine my feet aching after walking several miles without appropriate footwear and my throat feeling parched after running out of water. I cheered for the four characters – who were diverse in nature – and I hoped they would succeed in outrunning, and outgunning, the enemy – which happened to be someone much closer than the teens would have expected. Essentially, this foursome was brought together as strangers yet, ultimately, began to share the bonds of a real family who looked out for each other, regardless of personal feelings and challenges. There are various truths brought to light in Wanted. However, a theme which carries throughout the book is that we can’t change the past; we can only take the sum of our experiences and deal with them so that we can find a way to live with the past in relative peace. Trying to numb our senses to escape the pain will not take it away and will only add more anxiety to our lives. Continually throwing pity parties for ourselves will not work. Trying to justify bad behaviour is not the answer nor is trying to blame others for the perpetual state of our lives. The challenge is to move beyond the past and, in so doing, we may actually find the acceptance we seek. I’m definitely looking forward to reading Ice Princess, the second book in the series. I want to see what happens to these characters whose individuality and story intrigues me. If you would like to learn more about the book, click the cover which will take you to its page on Amazon.